In Madden 19, we’ve continued our multi-year project to expand our stadium exteriors with updates to the homes of several NFL teams. These stadiums include the Buffalo Bills, Chicago Bears, Tampa Bay Buccaneers, Kansas City Chiefs, Miami Dolphins, Atlanta Falcons, New England Patriots, and Tennessee Titans. We’ve taken trips to scan each of these stadiums, which helps us accurately reflect the venue and make the location feel as authentic as possible. In addition, the exteriors enable us to set the stage and mimic the camera views you see on actual NFL broadcasts. 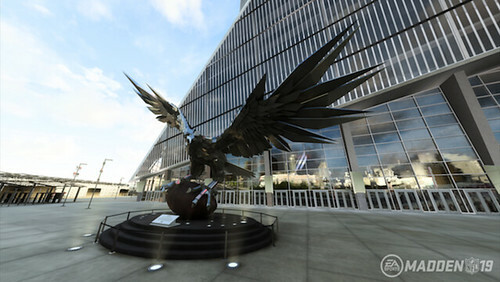 As part of the exteriors, we’ve included iconic statues and structures that you would pass on your way to the entry gates, such as the 73,000-pound falcon statue outside of Mercedes-Benz Stadium and the iconic architecture of Soldier Field. We’ve updated our broadcast package with vibrant graphic elements powered by our Frostbite Engine in real-time. 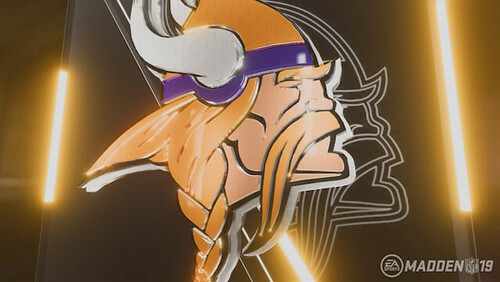 For Madden, we’ll have content for our basic branding, EA SPORTS, NFL Shield Logo, and postseason content, as well as specific team logos and helmet visuals for the 32 NFL teams and our 50+ expansion teams. 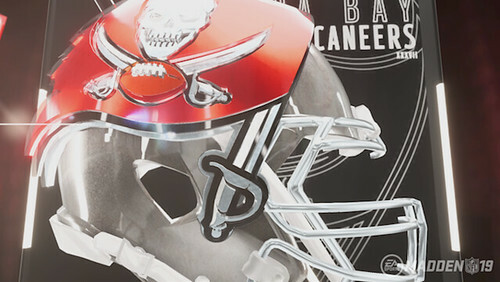 The team logos will be utilized for our day games and expansion teams and the team helmet assets are shown during Primetime and postseason games to make those types of broadcasts feel different. With this being real-time content, we’ll be able to modify the look with lighting or other visual effects for years to come. It also opens the door for more complex visuals in the future, as we can be more dynamic with the content that is shown instead of having to rely on video content that is static and requires more assets to create variety. 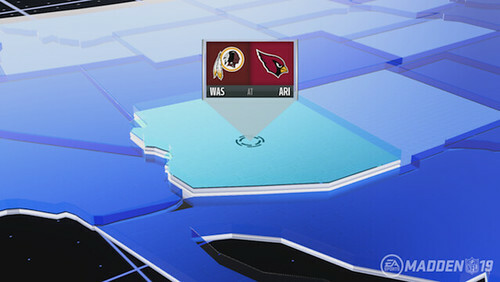 With the addition of the 3D Broadcast Graphics, we’ve also updated our pregame and halftime flows to take advantage of those real-time visuals and provide fresh content in Madden 19. Firstly, we’ve created a pregame flow to get you ready for your game with quick cuts of 3D visuals paired with high-energy music as our studio commentator sets the stage before he sends you to the stadium come game time. Once we’ve finished the bumper piece, we reveal the setting of the contest as Brandon Gaudin and Charles Davis talk through the in-stadium, pregame experience. The updated Halftime Show takes you around a 3D map as we check in on the other games in progress, finished, or upcoming in your current week in Franchise. As we zoom from city to city, we provide scores and stats, keeping you informed of important games as they relate to your team. 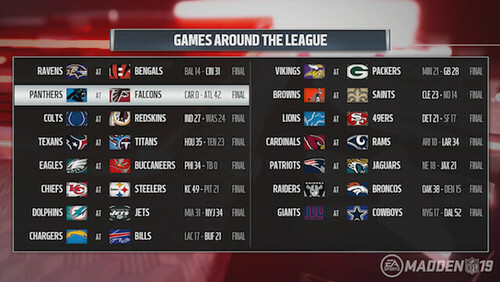 Depending on when your game is scheduled, we will show you final scores and stats or talk to what is in store for this week’s action via our League Schedule banner. Should you participate in a non-Franchise game, we’ve created an abridged flow to get you quickly back to the action. We’ve added two additional cameras types to our replay presentation: Orbital and Overhead. The Orbital Camera is an action shot where we ramp down the replay feed then rotate the camera 360 degrees around the action. It enables us to showcase player authenticity and animations like what you see in Hollywood action films. The Overhead Camera shoots directly down the goal line to show when the player has broken the plane for a touchdown. It’s a unique perspective as you get to see the holes in the blocking in a more defined way, as well as follow a player as he dives over the pile into the end zone. In addition to these two new replay camera angles, we’ve enabled post-play replays for H2H games. Now, when you score a touchdown, sack the QB, or make a game-winning play, you’ll be able to make your opponent relive that moment. As we continue to improve the believability of our commentary team, we’ve added the concept of “calling back” on a previously said line or topic during the game. 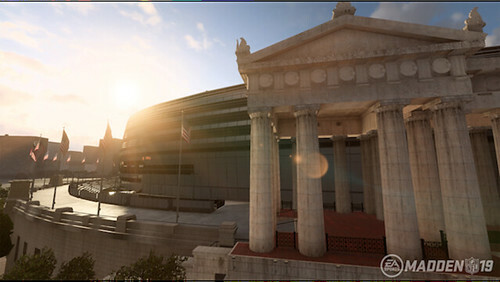 The goal of this feature is to allow our commentary to carry a storyline throughout the game, drive, or moment. This gives the impression that our commentary team knows what they’ve said in the past and are following along with the developments of the stories you’ve triggered during the game. Here is an example of a Call-back story of a moment: It’s third-and-long and the offense is backed up against their own end zone. Charles mentions that he would try to get some room for the punter by running the ball or possibly catching the defense off guard with a screen. Based on your call and the results of the next play, let’s say it was an incomplete pass, Brandon will reference what Charles said before about not wanting to be compressed in your end zone. Charles will respond, re-iterating that passing backed up is a gamble, and now your punter will have to get the punt away out the back of his own end zone with the defense able to put more pressure on him, which is risky. Another instance could be Charles talking about how an opposing running back was a 1,000-yard rusher last season and keeping him under 100 yards this game will be paramount in giving you the best chance for victory. As the game progresses, he and Brandon will reference how you are, or aren’t, keeping your opponent away from that 100-yard threshold and how it’s impacting likely outcome for this contest. 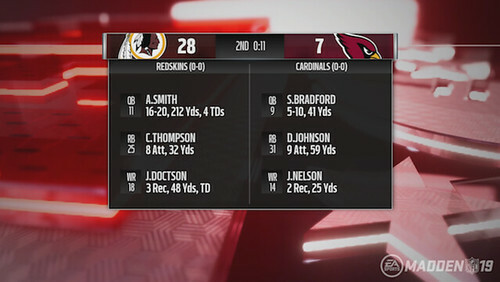 I'm probably alone on this, but I wish they'd revamp the score banner, stat overlays, and even the playcall screen in-game. No matter what they do or add elsewhere in the game, once I see the same thing for the third (?) straight year, I can't help but get a feeling it's the same game again, no matter how it plays. Franchise is finally being NCAA’d in terms of presentation. Really makes me miss NCAA. 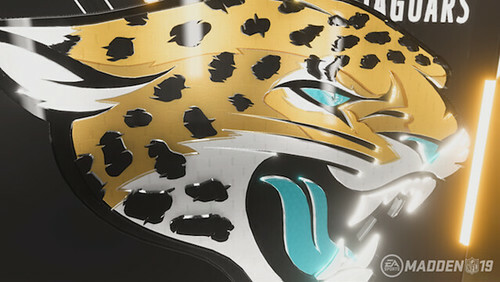 Though hopefully Madden will improve over the coming years with the addition of stuff already announced this year and more that could be added that were done in NCAA. Is there no chance of a user camera? Or at least options to adjust height and zoom for the current cameras? That may not be presentation but it would be so nice to be able to create a Tecmo camera angle. Broadcast is too close. I so badly want a weekly wrap up show. Halftime is a start but this feature is desperately needed. FYI I didn’t see a single stadium exterior for the entire season and playoffs. What gives? I'm not sure but I think those scenes may only trigger with open air stadiums. Maybe since you used the Saints you didn't get enough chances for it to trigger on road games? I've seen one in my season and it was Lucas Oil Stadium.